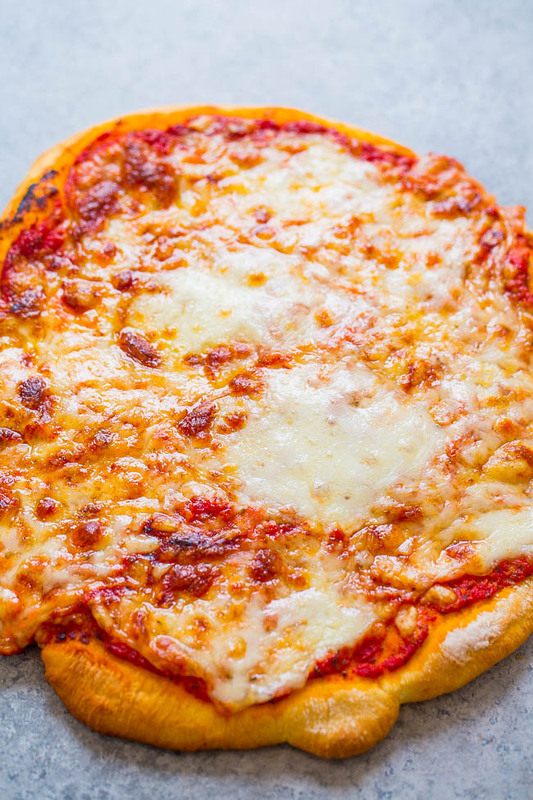 Three Cheese Pizza – Homemade pizza is the BEST!! And where there are 3 cheeses involved, even better!! Fast, easy, and better than calling for pizza delivery!! I love homemade pizza but I will admit that I don’t always make the time for it. That is until I received everything I needed to make this pizza with three wonderful, gooey cheeses from Blue Apron. 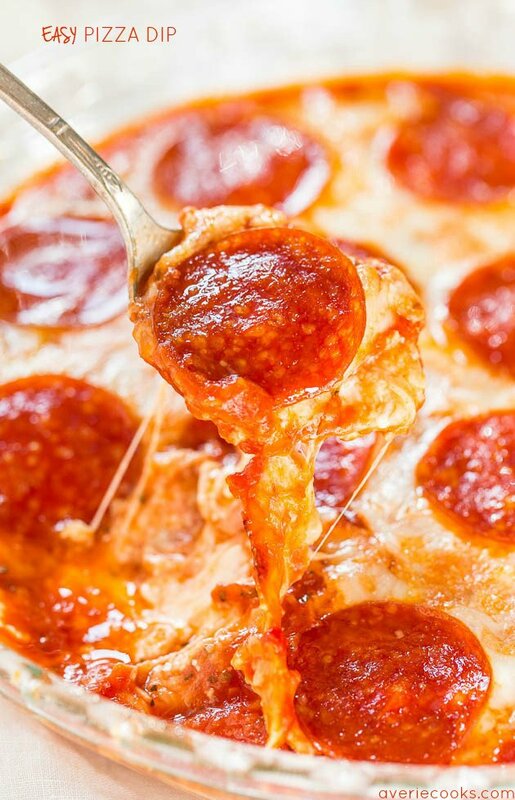 So cheesy and fabulous and the crust is soft and tender. Along with the pizza, there’s a lovely butter lettuce salad since rounding out three cheeses with salad is always a good idea. Blue Apron allows you to create delicious, chef-designed recipes at home. 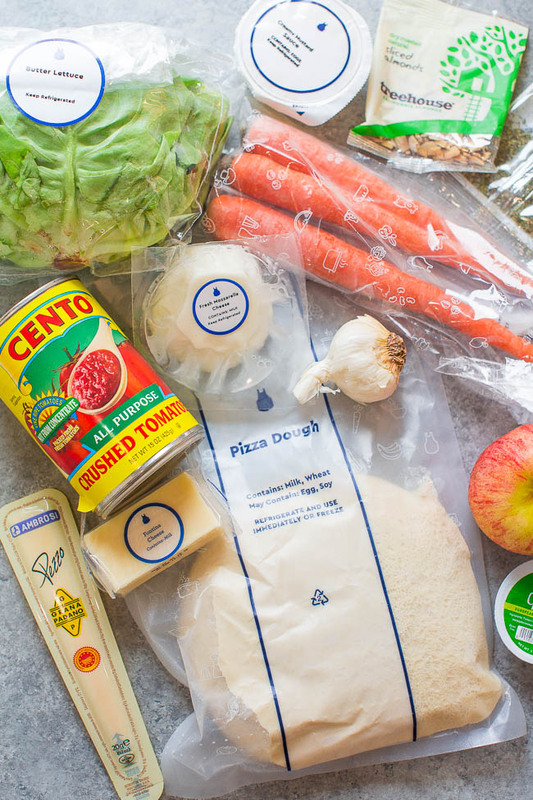 The first 100 readers will get $50 off their first two weeks of Blue Apron. If you’ve never tried Blue Apron, they are a meal delivery service that delivers all the farm-fresh ingredients you need, right to your doorstep in a refrigerated box, in exactly the right proportions to make the meals of your choice. You’re still doing the cooking, but in a mindless way so to speak. There are no trips to the grocery store and there’s no waste from unused ingredients because they send y0u only what you need, and not more. How many times for example do you buy a bunch of herbs, only use a tablespoon, and the rest goes to waste. Not with Blue Apron because you receive just what you need. Blue Apron offers two types of plans – the 2-Person Plan and the Family Plan – with 8 recipes to choose from each week. You can choose any combination of recipes you like and they are always adding new dishes that you can select. The step-by-step recipes are included on sturdy card stock so you don’t have to worry about printing anything out or trying to cook from your phone screen. In addition to the ingredients for this Three Cheese Pizza, I also received the ingredients for an easy Mediterranean Seared Salmon recipe and a Popcorn Chicken dish that’s bursting with Asian-inspired flavors. Everything from Blue Apron is ready in less than 40 minutes and is 500-800 calories per person. There’s no commitment – you can skip or cancel the service at anytime. Prices start as low as $8.99 per serving. Remember that the first 100 readers will get $50 off their first two weeks of Blue Apron. Remove the dough from the refrigerator to bring to room temperature. Preheat the oven to 475°F. Peel and roughly chop the garlic. Grate the fontina cheese on the large side of a box grater. Tear the mozzarella cheese into small pieces. Grate the Grana Padano cheese on the small side of a box grater. Make the sauce. In a small pot, heat 1 tablespoon of olive oil on medium-high until hot. Add the chopped garlic; season with salt and pepper. Cook, stirring frequently, 30 seconds to 1 minute, or until slightly softened. Add the tomatoes (carefully, as the liquid may splatter) and Italian seasoning; season with salt and pepper. Cook, stirring occasionally, 4 to 5 minutes, or until slightly thickened. Turn off the heat, add the Quark Cheese, and season with salt and pepper to taste. Assemble and bake the pizza. Lightly oil a sheet pan. On a work surface, using your hands and a rolling pin (or a wine bottle), gently stretch and roll the dough to a 1/4-inch thickness. (If the dough is resistant, let rest 5 minutes.) Carefully transfer to the sheet pan; rub into the pan to coat the bottom in oil. Leaving a 1-inch border around the edges, spread enough of the sauce onto the dough to coat (you may have extra sauce). Evenly top with the grated fontina cheese, torn mozzarella cheese, and half the grated Grana Padano cheese; season with salt and pepper. 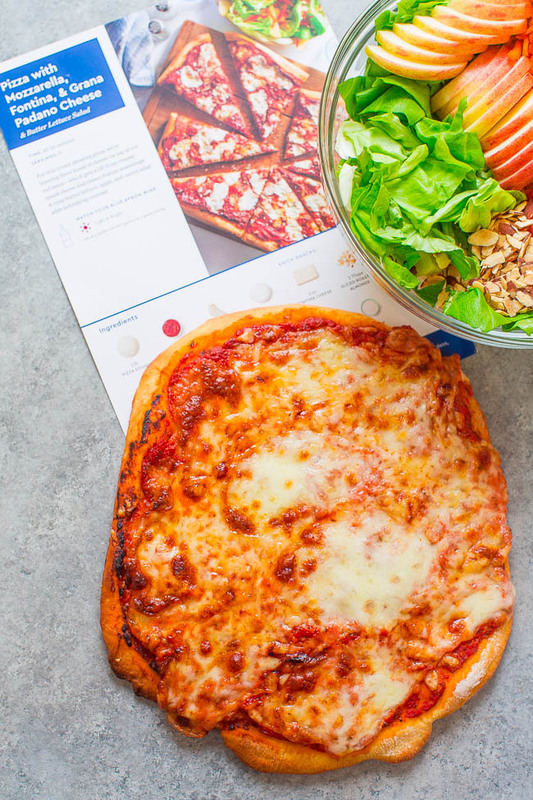 Blue Apron’s recommendation is to bake 17 to 19 minutes, or until the cheese is melted and the crust is golden brown; however my pizza was done after 14 minutes. Remove from the oven and let stand at least 2 minutes. Prepare the salad. While the pizza bakes, wash and dry the fresh produce. Cut off and discard the root end of the lettuce; separate the leaves. Peel the carrots and grate on the large side of a box grater. Quarter, core, and thinly slice the apple. Combine in a large bowl. Make the dressing. While the pizza continues to bake, in a bowl, whisk together the creamy mustard sauce and 1 tablespoon of olive oil. Season with salt and pepper to taste. Just before serving, to the bowl of prepared salad ingredients, add the almonds and enough of the dressing to coat (you may have extra dressing); season with salt and pepper. Toss to combine. Season with salt and pepper to taste. Slice pizza and serve. 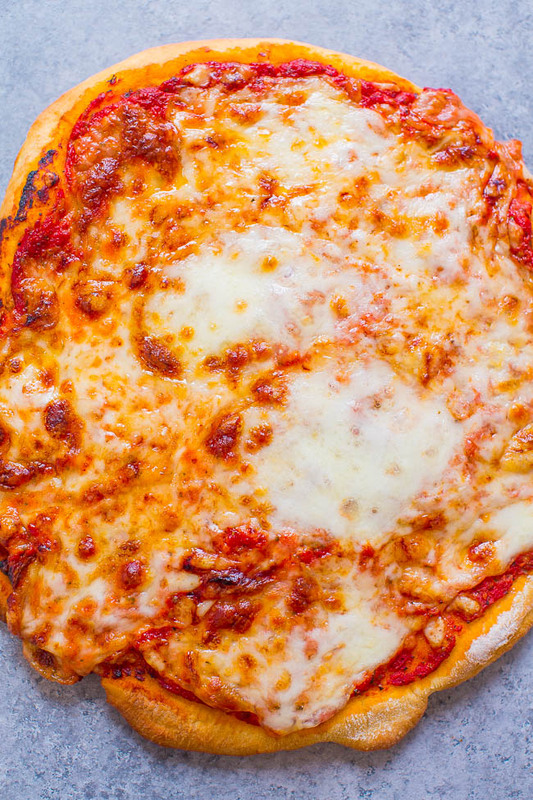 Transfer the baked pizza to a cutting board and cut into equal-sized pieces. Serve the sliced pizza with the salad on the side. Garnish the pizza with the remaining grated Grana Padano cheese. Barbecue Chicken Pizza – A copycat version of California Pizza Kitchen’s bbq chicken pizza that you can make at home in 15 minutes! 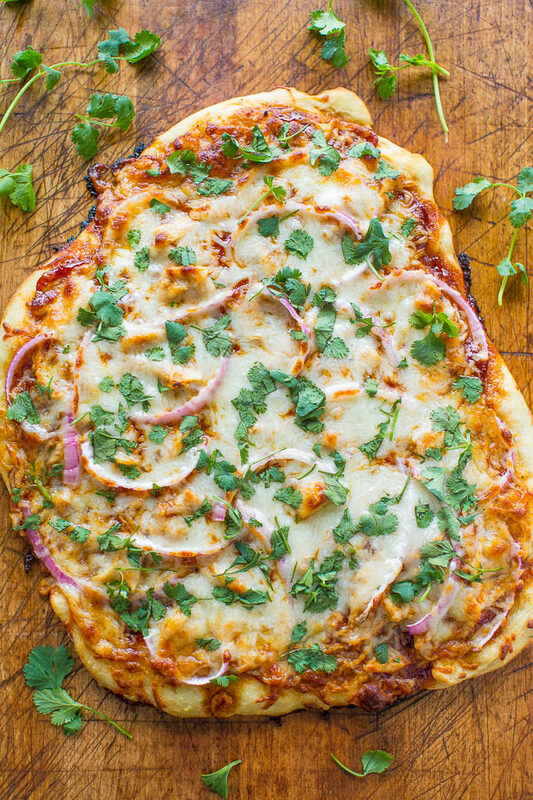 EASY, loaded with juicy chicken, red onions, cilantro, and lots of cheese! 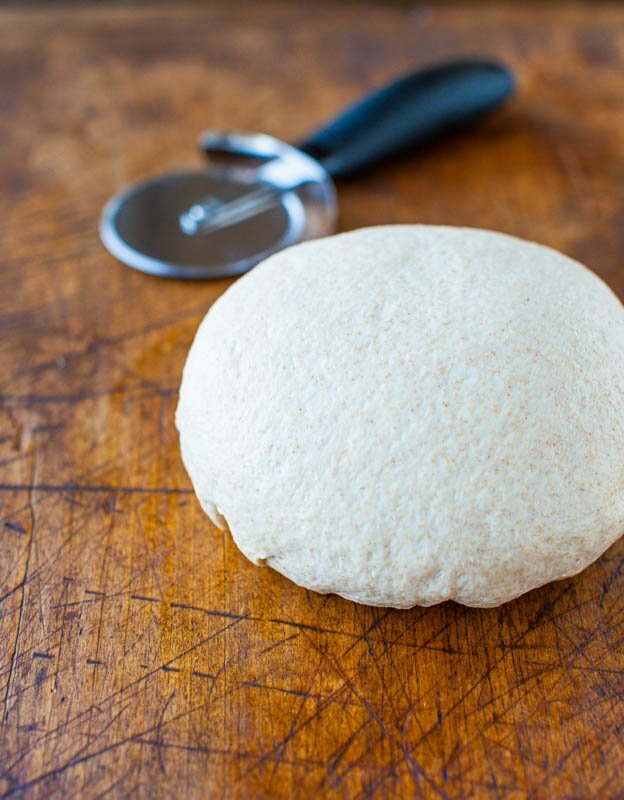 One Hour Whole Wheat Pizza Dough – An easy pizza dough that’s healthier because of the whole wheat flour! Ready in one hour! 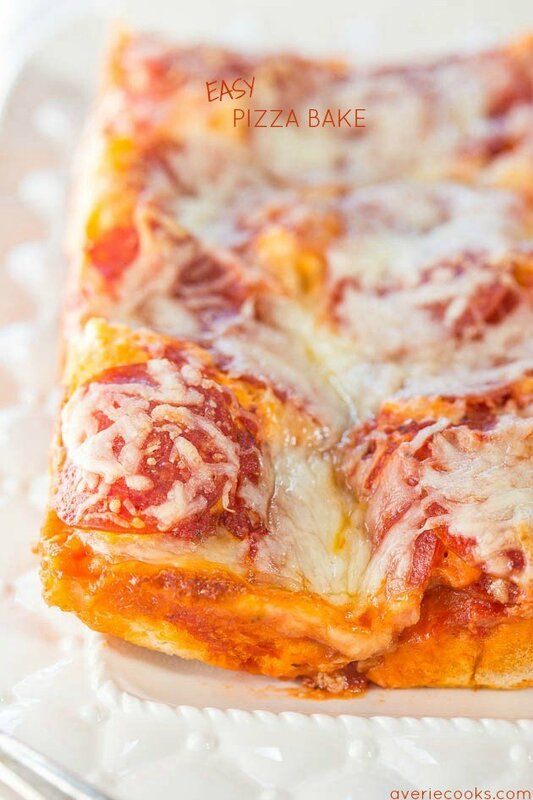 Easy Pizza Bake – Skip takeout and make your own warm and cheesy deep dish pizza bake! Fast, easy, and ready in 30 minutes! It’s a keeper everyone loves! 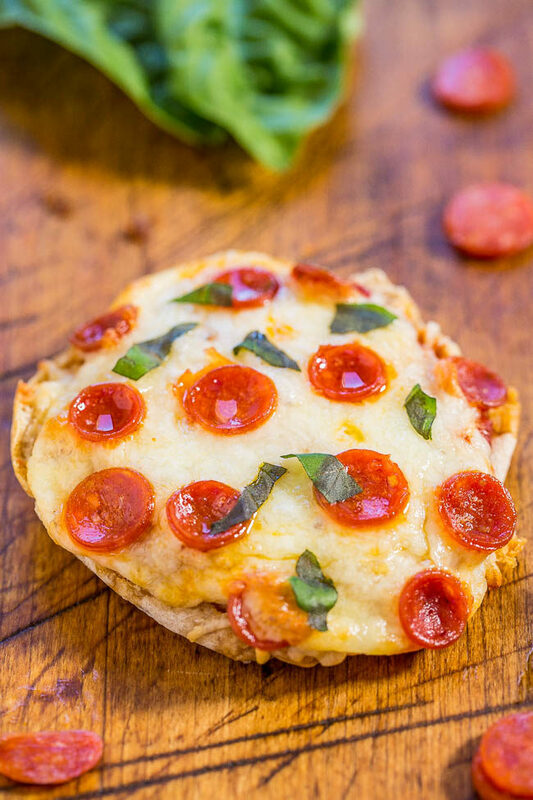 Easy Mini Pepperoni Pizzas – Ready in 10 minutes, mindlessly easy, and mini food just tastes better! Great as an appetizer, after-school or late-night snack, or as perfect tailgating party food! Easy Pizza Dip – Cheese lovers and pizza fans will love this fast and easy dip! Perfect party food that’s a guaranteed hit! 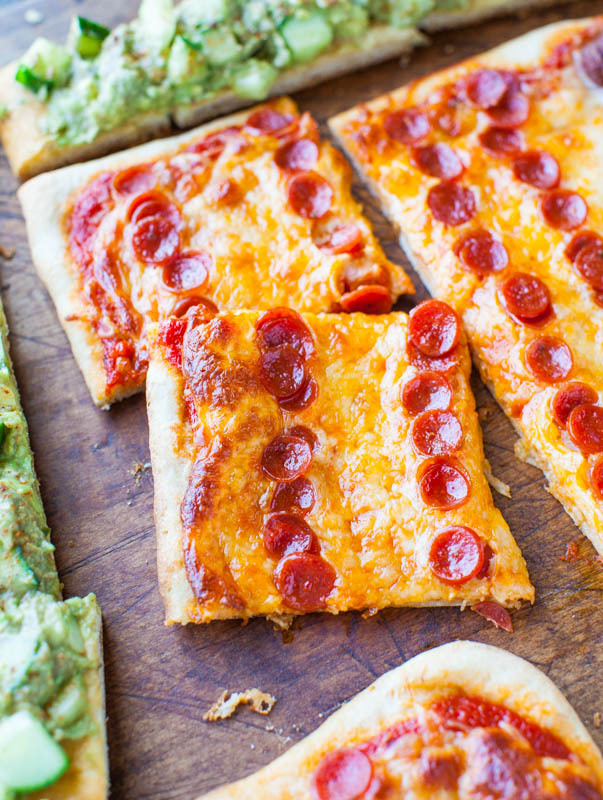 Pepperoni Pizza and Chipotle Avocado Cucumber Flatbreads– Fun, easy and great for game days! 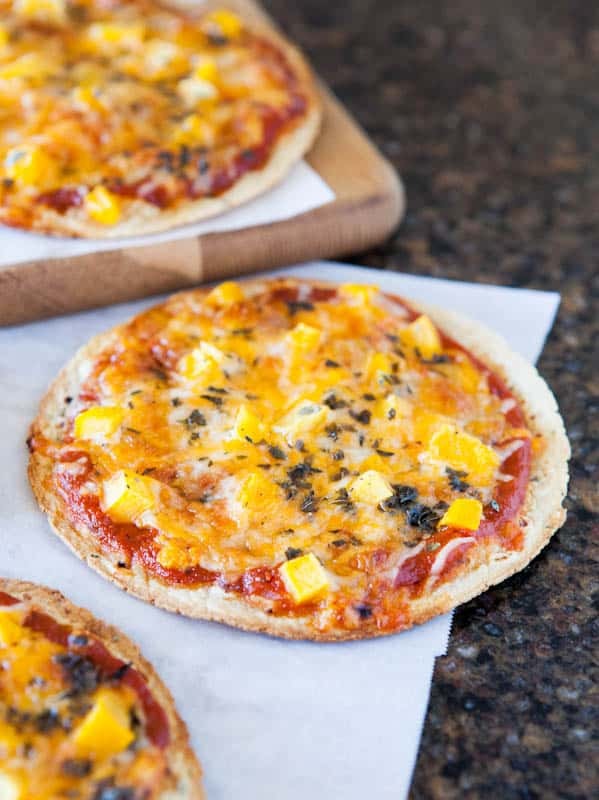 Mango Basil Personal-Sized Tortilla Pizzas – Storebought tortilla shells bake up thin, crispy, and are easy to use for personal-sized pizzas! Everyone can choose their toppings! 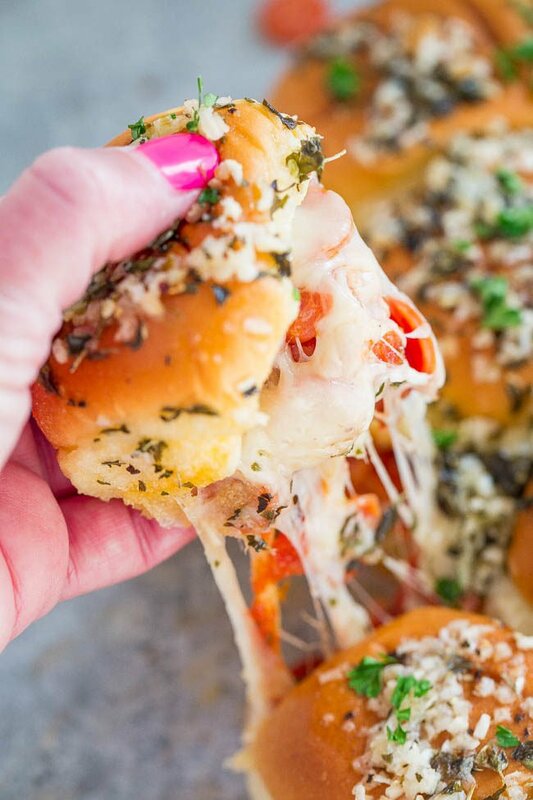 Pepperoni Pizza Sliders – Pizza by way of supremely cheesy sliders! Easy, ready in 15 minutes, and perfect for parties because everyone loves them! Totally irresistible! Post is sponsored by Blue Apron. The recipe, images, text, and opinions expressed are my own. I’ve heard of this meal service–it sure does look good…and convenient! 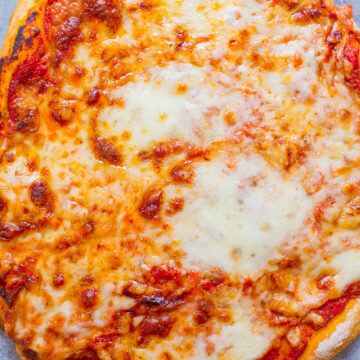 Homemade pizza is so much easier with pre-made dough and they really include some quality cheeses too. Definitely convenient and I adored all the different cheeses – so tasty! Have a great week! I want this pizza for lunch today! It’s so perfectly cheesy! This looks yummy. I saw that 2 T of Quark cheese are in the list of ingredients but can’t find where it was used in the recipes. At the end of Step 2. I received this in my Blue Apron box a couple weeks ago and I LOVED it! Made a vow since to always get pizza from Blue Apron anytime it comes up! The crust and cheeses were just superb. I did add a gourmet blend of mushrooms that I sauteed as well though. So good! What is quark cheese? I’ve never seen it. I would describe it as somewhere in between a cream cheese and mascarpone.